The Christmas Holidays behind us, the students have returned to Nazareth House Apostolate School in Kabala and resumed their studies for well over a month. which we partitioned from the original room space in order to accommodate the growing attendance and need for more classrooms. The day is fast approaching that we will have to build an addition on to the school. Despite the crowding, the teachers are doing a tremendous job and the students are excelling in acquiring knowledge. Students in Kabala have to contend with many obstacles that most students in the USA do not. they come to school hungry, and they have to walk miles (and I mean actual miles) to get to school. In America, we smile at our parents as they reminisce about having "had to walk to school several miles in the snow - uphill both ways." In Kabala, there is no snow - but there is heavy rains or extreme heat, they do walk many miles to get to school and the “hills” they must climb to remain in school are the stumbling blocks they must face daily which come at them from all directions. 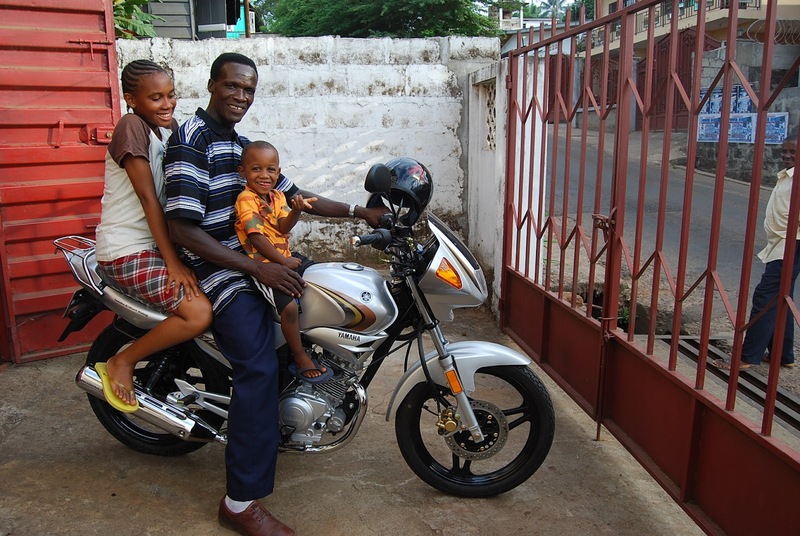 Pa Foday continues to use the motorbike purchased for him by NHA to check on the students and their families. If a child doesn’t make it to school, Pa Foday immediately goes to the student’s home to see what is going on and how to help get the child back to receiving regular education. There is so much more to running a school in Africa than grading papers, it takes involvement at all levels - at the school, in the community and in the life at home. One student that you know well, who has suffered illness and been away from his school desk at the NHA School has now made his way back. Roo who is recovering from severe anemia and complications stemming from that illness, flings his backpack on his back and crosses the dirt road from his home in the NHA Compound to the NHA School. Once back at his desk, Roo eagerly gets back to the business of learning. A solid, well rounded education is the basis for personal growth and ability to provide for oneself. This also applies to a community. Education opens many doors and gives opportunity for betterment. For this reason, its is vital that your prayers and support for the work of Nazareth House Apostolate remain ongoing.